This is the day on our Gold Expedition that we had been most looking forward to: Kinder Scout day. 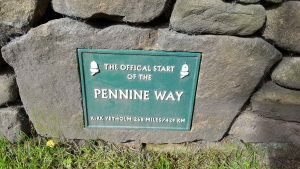 Despite the misty and windy weather we were excited to do our first bit of the Pennine Way and the beginning was gentle; along fields and farmland. Jacob’s Ladder was our first real assent and after a quick stop for coffee and jelly babies we got to the top to see the first of many amazing views. If you think that the top of Jacob’s Ladder was the top of the overall climb then you’re sadly mistaken … there was more climbing to go. Although it was steep there were well marked paths and sometimes steps to help us on our way. 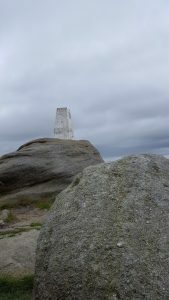 By the time we got to the trig point we were satisfied that we had had a good walk and had well and truly deserved our cheese sandwiches. 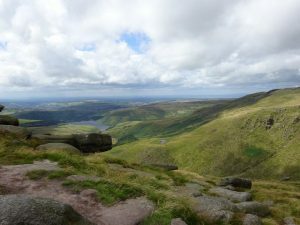 The highest point of Kinder Scout is 3 metres higher than the trig point and a few hundred metres to the East but we were more than happy with our success and had more areas to explore so we didn’t venture to the highest point. 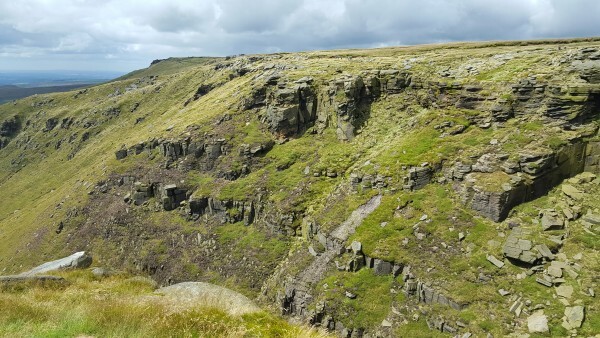 After another 2 kilometres of walking with stunning views to our left we came to Kinder Downfall and marvelled for a while at the very strange activities of the waterfall. The views down to Mermaid’s Pool, Kinder Reservoir and over to the continuation of the Pennine Way were fantastic and after our day up Mam Tor we were very grateful to have a clear day to see it all. At the waterfall we walked East away from the Pennine Way and began our journey through the bogs. It began well! We walked for several kilometres following the river. There was hardly any water so the walking was excellent and most of the way we were actually in the river bed. There were a series of cairns leading the way. At the point where we only had another kilometre to go through the bogs before reaching more firm ground the going got a bit tough. We were faced with bogs (very well maintained with dams) all around and not a cairn in sight. A Blonde meeting was necessary! 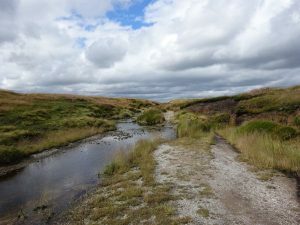 After a few minutes we decided that the route ahead looked impassable without wading hip-deep in peat bogs (which we didn’t fancy at all) so we would return the way we came. Initially we were a bit annoyed but we soon realised that the route up had been well worth a second look. The pint at the pub at the end of the day was very welcome indeed. On our return home we have discovered that there is a route through the bog! Very glad we are not mounting a search party through all those peat hags! The route was non-existent in the sixties, trodden to watery soup, feet deep, in the seventies, and – – perhaps it’s time I had another look! The only good thing about peat is its light weight – it tends to tumble off your boots, unlike real bog. 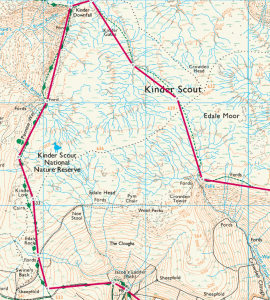 I would like to try the route from Edale up, it might be easier that way (said the optimist).